Your Takeout menu is growing. Today's entrée: YouTube videos. Previously, you've been able to download individual transcoded videos from your YouTube Video Manager. 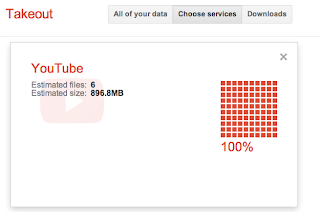 But starting today, you also have a more efficient way to download your videos from YouTube. 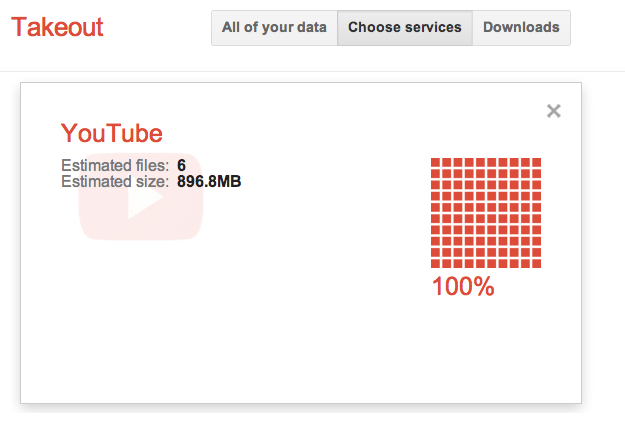 With Google Takeout, you can download all of the original videos that you have uploaded in a few simple clicks. No transcoding or transformation -- you’ll get exactly the same videos that you first uploaded. Your videos in. Your videos out. Posted by Brian Hawkins, YouTube Engineer and Data Liberator. Very good! It would be nice if this could be extended to videos uploaded to Google+ / Picasa Web. What about the video copyrights? It's legal? MkoEC — you get your videos only, not anyone's videos. This is fantastic news, it would also be great if we can cherry pick individual uploads through the YouTube interface. Until then I welcome this entrée to Google Takeout! After uploading the O2 Installer video, I took at look at the O2 related videos stats and was amazed to see that there were 20 subscribers with about 12,000 views of O2 related videos.